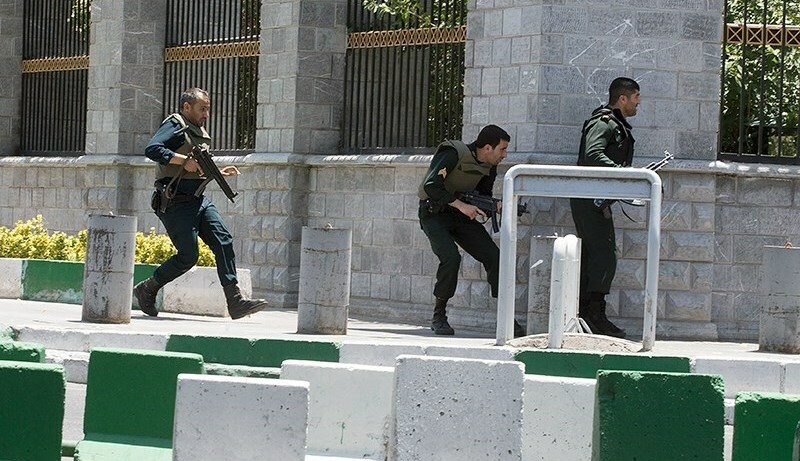 The 7 June 2017 terrorist attacks in Tehran consisted of two simultaneous attacks on the the Iranian parliament and the Mausoleum of Ruhollah Khomeini, shrine of Iran’s revolutionary founder, Ayatollah Khomeini. The twin attacks left 12 dead and 42 wounded. Islamic State claimed responsibility for both attacks. Apparently these were the first terror attacks carried out by Islamic State (IS) in Iran. In relation to the background of the recent terrorist attacks on the general elections in Great Britain the question arises why the attacks came only 2 weeks after Donald Trumps weapon deal visit to the Saudi Arabia the most important supporter of the Islamic State. Trump had announced to support the Sunnite fight against Iran as the most important Schiite nation. Astrogeographic position of Theran for morphogenetic field level 1 which describes the international topics of the Iranian capital and government: Tehran the capital of Persia (Iran) is located at 17° of air sign Libra and 13° of water sign Scorpio. 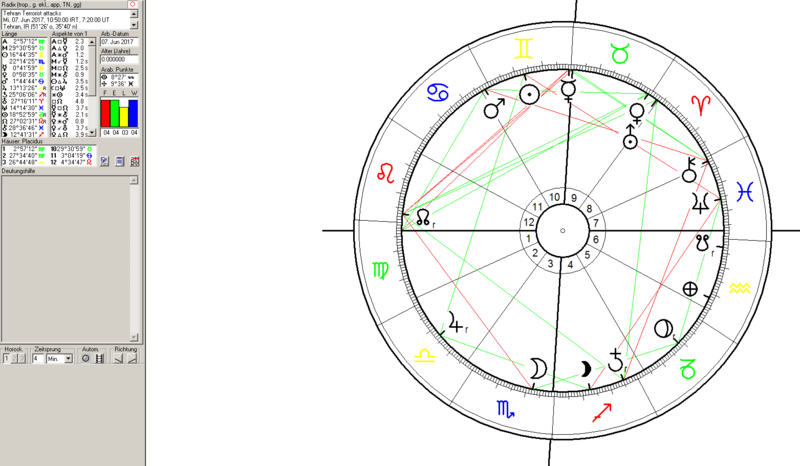 The Tehran attacks came during the 4 year long transit of Pluto over 17° Capricorn in exact square to the astrogeographic position of Tehran at 17°Libra begun in March 2015. The transit indicates intense pressure on the position of Iranian governments. The pseudoislamistic terrorist attacks by IS contract killers in Tehran were carried out with ascendant in Virgo an indication of carefully planned cautious action and hiding of the attackers. The Virgo ascendant represents a bigger atmospherical and motivational difference to the recent attacks in Europe, which were carried out with ascendants in Leo and Sagittarius. indicators of the gaming and having fun appeal of such attacks. No less than 3 personal planets (Mercury, Venus, Mars) that recently changed signs were on the cusp of the respective houses they were in. The most prominent of them was Mercury at 0° in his own sign Gemini occupying midheaven (MC). Due to the fact that the change of sign indicates new eras all three planets play a major role in the new development brought about by these first terrorist attacks by the Islamic State in Iran.